What is Choose Your Side? This is a team based challenge event where players choose a team and compete for points and bragging rights. Players decide which team they will choose! 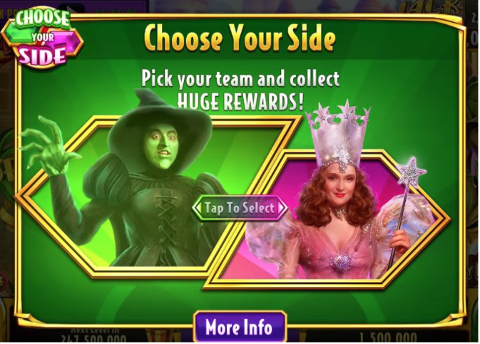 Select between Team Wicked Witch or Team Glinda. No, you cannot change teams once you have already picked a team. Collect symbols on the reels to earn points for your team. What does it look like in my lobby if I choose a team? 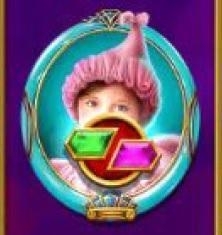 Bottom bar has a "green smoke" if you are Team Wicked Witch or "pink bubbles" if you are Team Glinda. What symbols do I look for in the reels? Symbols with green and pink. How do I check the score between teams? You can monitor the score in real time with your sidebar scoreboard! Can I invite Facebook friends to join my team? Yes, invite Facebook friends to play Choose Your Side with you and beat the other team! What rewards do I receive when I reach the Milestones? You can receive the following rewards: Credits, XP, Bonus Wheels, Mystery Gifts, Scratchers, Sneak Previews and Events! We would like to get your feedback about this feature, please fill out this Form.